H.P. Lovecraft once said: “The oldest and strongest emotion of mankind is fear, and the oldest and strongest kind of fear is fear of the unknow”. Fear slow you down. 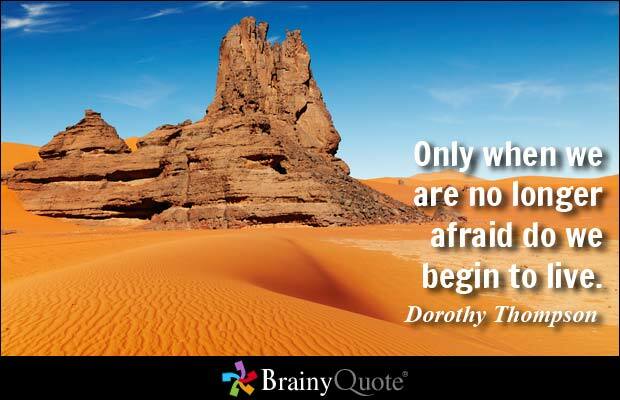 Fear paralyses you from attempting great things. The fear of failure suggests to you that you will fail if you attempt to do something significant with your life. The fear of poverty stops some people from investing their funds in productive ventures. They are scared that they may lose their investment and become poor. If you allow fear to rule in your life, you will end up with a life of mediocrity. Charles Stanley said “Fear stifles our thinking and actions. It create indecisiveness that results in stagnation. I have know talented people who procrastinate indefinitely rather than risk failure. Lost opportunities cause erosion of confidence, and the downward spiral begins”. No one ever achieved greatness who listened to the voice of fear. Great people attempt impossible dreams and achieve them inspite of the fear they feel. Successful people feel fear but still do what they need to do to succeed. If you believe that your dream is a responsibility that life has placed on your shoulders then, no matter what you feel, stand up and do what you must. Courage is acting on your dream inspite of the fear you feel. The best way to master fear is to acquire as much knowledge as you can in the area of your calling. Fear holds sway mostly in the mind of the ignorant. When you know what you are doing, you are not moved by circumstance or what people say, you act decisively based on accurate information. Knowledge is light. Ignorance is darkness. When you walk in the light of accurate information, you will dispel the darkness of ignorance and step out with confidence to achieve your goals. Fear inhabits and inhabits the mind of the ignorant. The bible says that the people who know their God will be strong and do exploits or accomplish great things. If you want to accomplish great things you should know your God intimately. Knowledge is a reservoir of power. An enlightened person draw from an inner dept of strength that instigates and sustains his or her drive for significance. It’s this inner strength that propels the enlightened towards great achievement. Many years ago, I discovered that the difference between the great and the unsuccessful is their level of information. It used to confused me how some people accomplished great things. I thought it was because of their talent, or social connections until I discovered that the difference between them is information. If you talk to a successful people, you will noticed that they know what they are doing. They have mastered the area of their calling. They don’t operate by guess work. They don’t stumble into success neither does it happen by some unfathomable power. This entry was posted in success and tagged Consistent, Discipline, Dream, Encouragement, Fulfillment, Growth, Habit, Insight, Journey, Life, Life changing principles, motivation, Passion, Persistence, Personal, Principles, Spiritual, success, Successful, Talent, Wisdom.